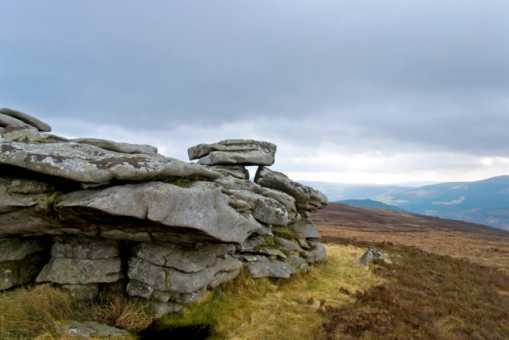 In the 18th century, it was suggested that tors were artificial constructions raised by the druids, but that speculation was swept aside by the development of geology as a science. There was even a stormy ‘tor controversy’ in Britain, with a lot of hot air in the sails of several different theories. One of them, Linton’s two-stage theory, is still defended today and might provide a plausible explanation for our own homegrown variety. This theory argues that tors were first sculpted in the warmer Tertiary Period by the chemical action of acidulated underground water on the jointed, fractured granite bedrock, which caused decay along the cleavage lines. Essentially, the feldspar in the granite was altered to kaolinite (china clay). Later, during a phase of intense freeze/thaw conditions in the Quaternary Period, more exactly the Pleistocene, the decomposed rock was removed by a kind of soil creep, the downhill slippage of waterlogged sediment over the permafrost beneath. In this way the residual outcrops finally stood out in the light of day and were exposed, as they still are today, to the further destructive action of the elements.